Planning on heading to the track this season for the Spring Racing Carnival? Whether you intend to enter (and hopefully take out – we’ll keep our fingers crossed for you!) the Fashions on the Field competition or simply looking for any excuse to get dolled up and don a fancy frock, it’s important to put your best fashion foot forward and think about how you can stand out from the crowd when pulling your race-day ensemble together. One way to do just that is to take new-season trends and make them your own – be it by making unexpected outfit choices, pairing your attire with bold accessories or wearing a statement-making headpiece. In doing so, you’ll achieve a fashion trifecta – you’ll not only look très chic and trendy (in a good way!) but your outfit will also ooze originality since it captures your personality and signature style, which will ensure you turn heads when lingering trackside. Not in the know about what trackside looks are odds-on favourites this Spring Racing Season? 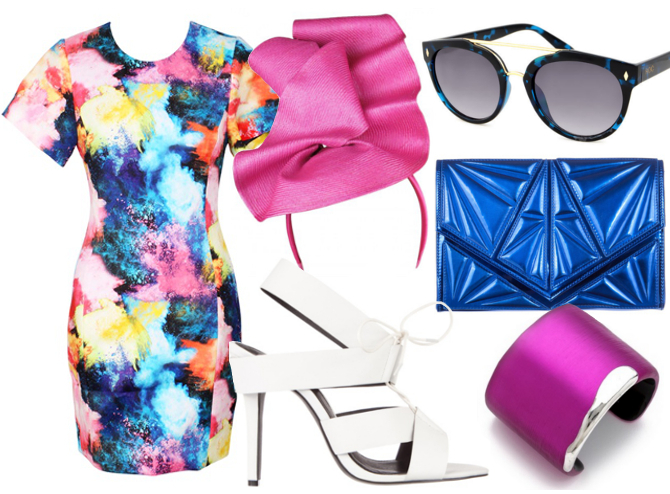 Don’t worry, because we’ve done all the hard work for you and created a racewear trend tip sheet outlining the top six looks we bet you’ll be seeing plenty of next time you’re at the races. We’ve even gone that extra mile and curated six ready-to-wear race-day looks based on these key trends – aren’t we a helpful bunch? While we’re more than happy for you to wear each ensemble below as is, we suggest you edit the outfits and add, swap or omit pieces where necessary so you can put your own stamp on each look – who knows, it’s the unique, personalised touches that may see you win the title of best dressed at the field! 1. 50s style This season is all about 50s-style silhouettes – think full and flouncy or slender pencil skirts, demure necklines, longer hemlines and nipped-in waists. Elegant and ladylike, this polished style is perfect for race day. Give your 50-inspired ensemble a modern twist by choosing pieces in on-trend colours (here, we’ve paired a powder blue and mint dress – pastel tones are the hottest hues to wear this season – with eye-popping fuchsia accents) or that feature unexpected patterns (like edgy graphic prints), or by completing your outfit with chunky or modern-look accessories. 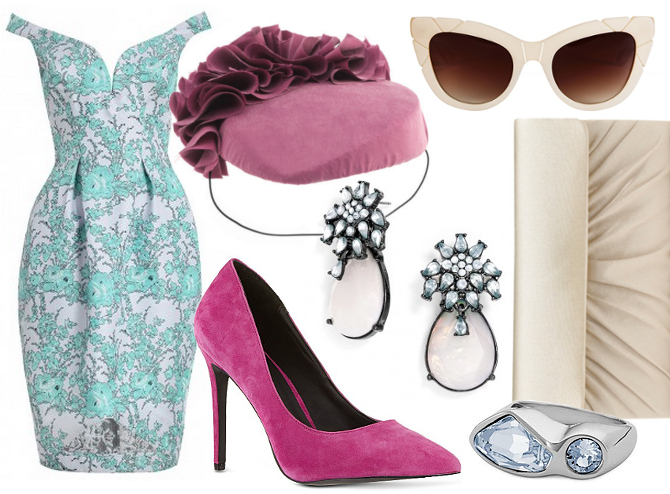 Zimmermann Tempo Brocade Inverted Dress, $550; KG Kurt Geiger Bailey Court Shoes in Fuchsia from Selfridges & Co., £99; Bundle MacLaren Millinery Ash Hat from Boticca, $377; Olga Berg Classic Gathered Fold Over Clutch in Champagne, $39.95; BaubleBar Chrysanthemum Drops in White, USD$36; Atelier Swarovski Ring in Crystal Blue Shade, $265; Pared Puss and Boots Shell Sunglasses, $240. 2. Peek-a-boo pins No, we’re not suggesting you wear thigh-skimming skirts or dresses to the track (leave these for nights when you’re heading out on the town, ladies), but don’t immediately turn your nose up to wearing frocks or midi skirts with asymmetrical hemlines, or a peek-a-boo slit that shows off your pins. As you can see here, this on-trend look can be tastefully done – the key is to keep the rest of your ensemble demure and ladylike. Manning Cartell Glassmaster Cropped Top, $399; Manning Cartell Polished Glaze Wrap Skirt, $599; Mimco X-Tastic Face Screen, $99.95; Mimco Passionatrix 100 Pump, $249; Olga Berg Ladylike Handbag in Black, $79.95; Mimco Hepburn Gem Wrist, $149. 3. Graphic chic What’s the easiest way to stop your fellow punters in their tracks? Wear a frock or separates that feature a stop-and-stare digi print, one of this season’s biggest trends. Complete your look with accessories that complement the colours of your outfit. Here, we’ve teamed a bright patterned dress with coordinating hot pink, cobalt blue and monochrome accents – notice how they tie the eye-popping ensemble together. AKIN by Giner & Smart Electric Cloud Dress, $269; Atmos&Here Polly Lace-Up Leather Heels from The Iconic, $99.95; Morgan & Taylor Yvonne Fascinator in Hot Pink, $199.95; Atmos&Here Geo Clutch from The Iconic, $39.95; Alexis Bittar Liquid Metal Edge Cuff Bracelet in Hot Pink, USD$195; ROC Eyewear Cruz Sunglasses in Blue Tortoiseshell, $89.95. 4. Feeling lacy Nothing says fresh, feminine and trackside chic like a frock made from lovely lace. Choose a design in a dreamy pastel colourway to knock over two of this season’s biggest trends in one go. Rodeo Show Marla Dress in Lotus, $329; Tony Bianco Kush Heel in Bone Pearl, $139.95; Bundle MacLaren Millinery Eden Headpiece from Boticca, $538; ASOS Clutch Bag With Neon Flower Embellishment, $66.55; David Jones Claw Stoneset Linked Bracelet, $39.97; Kate Spade New York Small Square Stud Earrings from Shopbop, USD$38. 5. Where’s your crop? Your cropped top, that is. As with skirts and dresses with asymmetrical hemlines or leg-revealing slits, the key to acing this trend while keeping things race-day appropriate is to avoid the urge to show too much skin. You can’t go wrong if you pair a cropped top with a pencil skirt that sits high on the waist. 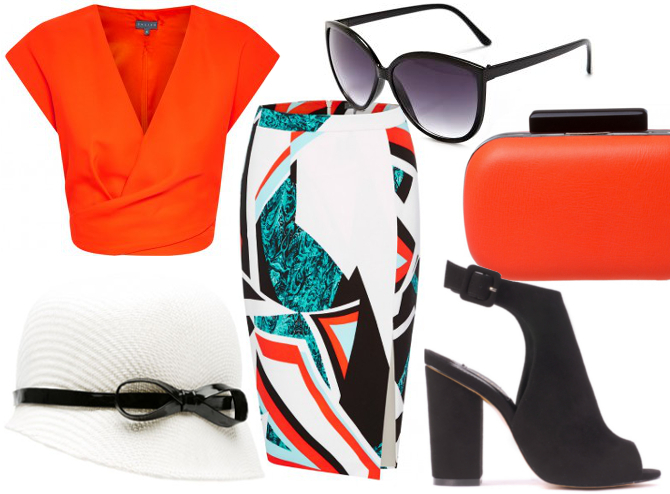 SHEIKE Enigma Top, $89.95; SHEIKE Pop Art Skirt, $109.95; Siren Shoes Goldie Heel in Black Suede, $159.95; Max Alexander Valerie Racewear Hat from Myer, $129; Colette Hayman Zia Hardcase Clutch in Orange, $34.95; eQUIP 50s Cats Eyes Sunglasses, $19.99. 6. Garden fresh Floral prints are a quintessential springtime pattern that are usually seen in abundance at the track. While dainty florals remain popular, this season is all about large, abstract botanical prints that instantly attract the eye. Ensure bold blooms remain the hero of your outfit by pairing patterned pieces with simple yet stylish accessories that are happy to take a supporting role. 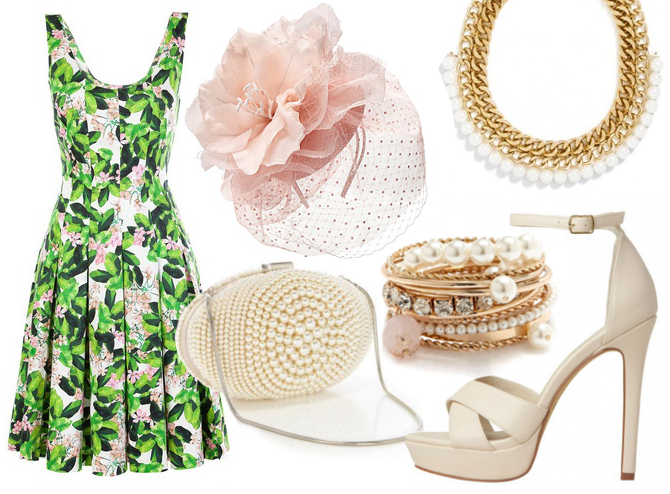 Alannah Hill Forbidden Garden Dress, $349; Lipstik Shoes Narli Heel in Bone, $79.95; Mimco Spot the Rox-Star Beret, $229; BaubleBar Pearl Lucille Links, USD$36; Coast Paloma Pearl Clutch from House of Fraser, £60; eQUIP 10 Pack Bangle Set, $19.99.